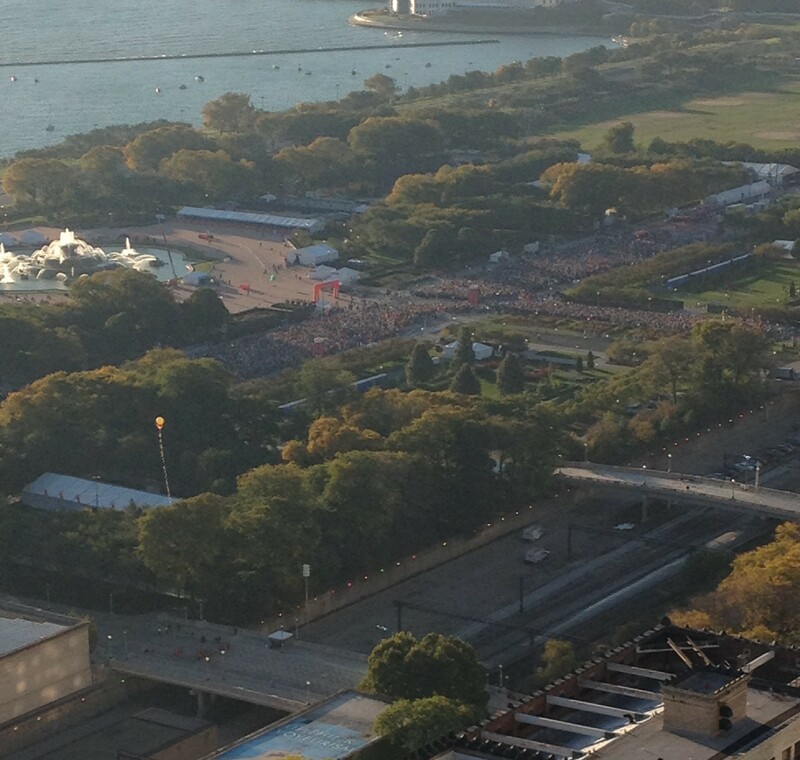 The non-elite runners lined up to start the Chicago marathon. My husband is running the Chicago Marathon for the 8th time in ten years. When he turned 50 he decided he wanted to run a marathon. So he started training and at age 51 ran his first full marathon. Over the years he had to miss two Chicago Marathons due to travel or injury. But he continues to train. And this year, at age 60, he is running again. I also prepared, for my role as a marathon spectator. This year was different. In January my husband herniated a disk in his spine. It was at the most inconvenient location, but with the miracle of surgery, he was able to have a microdiscectomy and recovered. However there were some issues he had to battle. First with no exercise for eight weeks, his right leg muscles had atrophied. He battled to get his leg back into shape. Even with all he did, that leg is still a bit weaker than it was before and his training took a bit of a hit. Second he is a drop slower than he was before. As I watch his progress in the marathon on text message alerts, I can see that he is running about 20 seconds a mile slower than he did last year at the beginning of the race. Not a major difference, but when you are going 26 miles…that adds minutes. And as the marathon progresses, I know he will slow down. So I am a bit worried in my role as spectator. I do not run marathons. I do not run. I walk. I enjoy walking. I try to walk 2.5 to 3 miles daily. Yesterday, as we are in Chicago I walked 8.9 miles all along the waterfront, in the Field Museum and along Michigan Avenue. Over 17,000 steps, but that is my limit. I have no desire at all to go 26 miles. In fact, to a degree, I think my husband is mildly insane. As is his friend who is running the marathon as well. The night before I went online and set up text messaging alerts so I would know when they started, hit 10 k, half way, 30 k and finished. It is important as a spectator to know when these events occur. I will admit, this year the notices were much more timely than they have been in the past. They started out together this morning. At 7:00 in the morning, they left the condo and walked to the corrals. I got up for a few minutes to take their annual pre-marathon photo. Then they left. They would start about the same time, but since his friend runs much quicker, (his starting pace was 10:41 per mile), he will be done at least an hour earlier than my husband if he keeps this pace. They prepared for this. They trained for this. They ate their pasta dinner last night. They have their special shoes, socks, clothes, their energy foods and drinks. They want to run. But at age 60 and one week; and age 59 and 10 ½ months, the training and the running take a toll. Before my husband ran this year, his cardiologist ran a new test. And my husband’s heart was fine. The doctor turned to me and said, “I wanted to tell him he could not run this year. But he looks great.” And that is all my husband needed. He brings me doctor reports each year to prove all is okay, because I am nervous about this 26.2 mile run. But as a spectator, I had to go along with the doctor’s decision. I fill out the back of my husband’s number bib with emergency numbers. I go to watch to make sure all is okay. They both know not to rush and to stop if it is too much. But with the weather as nice as it is, I know they will both finish this year. As a marathon spectator, I cheer on everyone I can. If I see someone with their name emblazed across their shirt, I scream for them. I figure if they put their name on they want the encouragement. I love watching for those who are newly married or engaged. They often wear veils or announcements on their shirts. This year was not different. I saw a couple wearing bright yellow shirts. One said “she said yes.” The other, “Newly engaged.” This year I saw someone wearing a Royals t-shirt. Of course I cheered him on. As a citizen of the Kansas City metro area, we are all Royals right now. There were people dressed as comic book heroes, Superman, Batman and Wonder Woman. There were people wearing capes, skirts and costumes. There was a man juggling as he walked. Some were running, some were walking, some were stretching, some were drinking energy drinks. All were intent on their goal. My friend and I always wait about the 16-mile marker to cheer our husbands on their trek. This year was a bit different. Usually we are part of a crowd of their children, spouses and a grandma. This year they all could not come. So it was just my friend and I. But we kept tradition. We waited till both of our husbands ran past. We gave them extra energy food and water. We provided each with encouragement. Then we completed another marathon tradition for us as spectators and walked to Athena Restaurant in Greek town for a delicious lunch. I took a photo for a young couple who were taking photos of each other. Of course they wanted a photo together with their medals and silver blankets, so I took it for them. When we returned to the condo we waited. The first text arrived. My friend’s husband was done. An hour later he returned. Tired, but happy. A short time later the other text arrived. My husband had completed the marathon. With his arrival back the marathon was officially over. They both ran faster than they had the year before and were both pleased with their run. They were tired and sore. But had a great sense of accomplishment. Now they start the plans for next year and another marathon. And I am ready to continue my role as marathon spectator. A job I enjoy!